I am always taking photos. The photos taken from 2009 to 2013 are brought together into a book. I usually press the shutter button only once when taking photos. That is because I value the moment captured through the finder. Taking a look around for anything worth taking a photo and compose into a picture would require thinking process which I’d rather avoid. So, I decided not to do that. I always want to follow my instinct rather than my head. 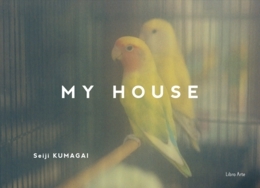 ”MY HOUSE”, the title of this book, is the word which reflects the state of my mind and has almost the same meaning as “my mind”. Color photography handles unlimited colors of RGB or CMY. The photos taken in Japan, Europe, and Asia. How should I determine the color tone of these? I always print my photographs without thinking about such a thing. But I stop being concerned about things like that and get anything all on my camera. It is here, and it is not here.